Universal Camera made a huge amount of money in the Depression selling ultra-cheap cameras and film. The quality was marginal, but when you were just scraping by, cheap cameras and film were better than nothing. They also marketed the hell out of it; their ads ran in Life magazine, among others. After the war they tried to go upscale; people had more money and those crappy little drugstore cameras couldn't compete anymore. 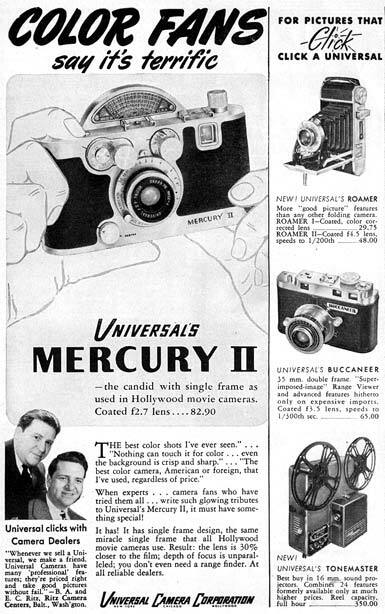 The Mercury II (that humpbacked beast at the top of the ad) was their high-end camera. It had a really neat focal plane shutter, but it was still half-frame, and it just couldn't compete against the Argus C3 and Kodak's many offerings, much less the European imports. They went under in the early 50s.